An illegitimate leader thumbs his nose at the international community and sends his security forces and armed supporters into the streets to gun down mostly unarmed opponents, who are demonstrating on behalf of democratic rule. Tribal and regional fault lines give way. Allegations of widespread human rights abuses grow as tens of thousands of displaced people seek refuge in other parts of a war-torn country, or seek safety across international borders. No, we're not talking about Libya, where the ever mercurial Muammar Qaddafi has unleashed loyal army units to quash a grassroots rebellion against his 41-year rule. All eyes in the Western media have been turned to this conflict, which has all the signs of turning into a protracted, bloody civil war. But the earlier scene depicted is not along Libya's Mediterranean coast but along West Africa's Atlantic coast, in Ivory Coast. There, in the former French colony, President Laurent Gbagbo continues to defy the United Nations, the African Union and regional organizations' demands to cede power. Three months ago, he lost a presidential runoff election to former Prime Minister Alassane Ouattara. Yet the Ivorian crisis commands scant media attention, at least in North America. "The American media has historically paid less attention to Francophone Africa," says Reed Kramer, chief executive officer and director of allAfrica.com, headquartered in Washington, D.C. "But I'm puzzled about the lack of coverage on Ivory Coast, because the U.S. government has been very vocal about developments there, and a lot of press coverage usually follows policy." Kramer founded Africa News, the precursor to allAfrica.com, nearly 40 years ago, in part to provide media coverage that mainstream organizations lacked. "It's very difficult to cover both situations with limited resources, but we do our best to keep it on the front page." Some argue that there is no excuse for news from Libya to be covered to the exclusion of Ivory Coast. Zartman, who has written several books about Africa and conflict resolution, says that the crisis in Côte d'Ivoire is a greater threat to international law than the situation in Libya. This is partly because of the presence of 9,000 peacekeepers with the United Nations Operation in Côte d'Ivoire (UNOCI). They are protecting Ouattara, who is holed up in a hotel in Abidjan. The Blue Helmets, as the U.N. peacekeepers are called, have recently come under attack from Gbagbo supporters. They were recently fired upon while attempting to investigate violations of an arms embargo. Gbagbo forces also prevented officials of the world body from investigating the site of two alleged mass graves. The Ivorian army, loyal to Gbagbo, has increasingly clashed with Forces Nouvelles, armed supporters of Ouattara. About 2,000 additional U.N. troops are being deployed to prevent the country from sliding further into civil war. "The U.N. is not present in Libya," says Zartman. 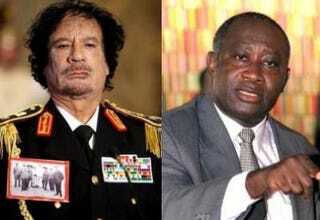 "The international community has condemned Qaddafi, but not as formally and broadly as Gbagbo. Qaddafi may not be legitimate, but he is not illegal. Gbagbo is not only illegitimate; he's illegal. He's been illegal for six years. He hasn't legally been president since 2005. Now, since he lost elections last year, he's doubly illegal." Ivory Coast is a big story in the European media, particularly the French media. Over the years the BBC, Radio France International and others have maintained a strong commitment to covering the world, which is easier and more cost effective for them because they are closer to many hotspots than their American counterparts. But the coverage of the conflict in Ivory Coast has been eclipsed by Libya in recent weeks, Zartman says, for two primary reasons: proximity and oil. Libya is a member of OPEC, and much of its oil is sold to European markets. Like many other North African countries, it is also a jumping-off point for African immigrants attempting to land in Western Europe. Ivory Coast, meanwhile, is a small producer of oil. But Zartman faults the Western media, specifically American outlets, for not doing more reporting on the crisis in Ivory Coast and elsewhere in sub-Saharan Africa. "One of these conflicts is in Africa south of the Sahara," he says. "There's the perception that there are no democratic systems down there and that they're always killing each other. [Western media] may not be any more favorable toward the Arabs, but there has been an unprecedented movement for democracy." Mark Quarterman — senior adviser and director of the Program on Crisis, Conflict, and Cooperation at the Center for Strategic and International Studies in Washington, D.C. — says that many American news organizations, amid shrinking budgets, have a hard time covering more than one international crisis at a time. "I think to a large extent, there's a follow-the-leader mentality that causes many of them to focus on a single event, to the exclusion of others," he asserts. "Events in the Arab world are extraordinary. Libya falls in line with that. And many of the reporters there now are coming from Egypt, where they were sent to cover the recent revolution." Still, Quarterman says, it is "shameful" that major U.S. media outlets "cannot apparently multitask in covering two similar situations." American audiences, he says, are being poorly served with blanket coverage of the Libyan crisis, while the escalating crisis in Ivory Coast is virtually ignored. Sunni M. Khalid, the managing news editor at WYPR-FM, has reported extensively throughout Africa and the Middle East.